Standing with the door to the fridge wide open, I took an inventory of what I had on hand. I always crave Mexican flavors, so used that to guide me. I grabbed a bunch of things, almost Rachael Ray style...a green pepper, red pepper, yellow pepper, Anaheim pepper, a white onion, a block of tofu, 2 tomatoes, a lime, and a bunch of cilantro. From the pantry I pulled out a can of chicken broth (after not finding a can of vegetable broth), flour, a bag of dried ancho chilies, a bag of dried guajillas, 2 cloves of garlic, olive oil, and then from my spice cabinet chose spices to include chili powder, cumin, Mexican oregano, and cayenne pepper as well as the salt. I soaked the dried peppers in water for about 20 minutes, then removed the seeds and finely chopped them. Making things up as I went along, I combined 3 tbsp flour and the spices - about 1.5 tbsp chili powder, 1 tsp cumin, 1/4 tsp cayenne, and 1/4 tsp Mexican oregano. 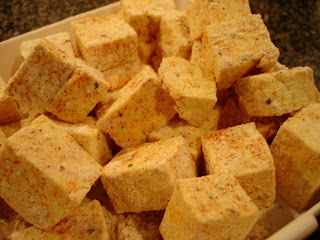 In the meantime, coat the tofu in the flour/spice mixture. Add the chopped, dried chilies to the pan and saute for 1 minute. 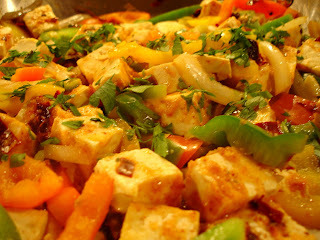 Move the chilies to the sides of the pan and add the tofu. Turn to brown on all sides. 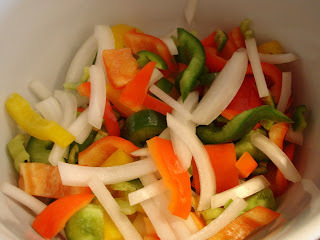 Add 6 oz chicken or vegetable broth along with the peppers, onions, and garlic. Let simmer for 3-4 minutes. Add juice from 1/2 of a lime as well as the cilantro and some salt. Stir and let simmer for a few minutes. Everything smelled great while cooking, but tasted even better. The dish was so fresh and light, all of the different flavors worked perfectly together, and there wasn't too much heat at all (for me, anyway). Coating the tofu in the flour and spices was a good call - the color was beautiful and it didn't get soggy when simmering in the broth. This would be a nice dish to serve over rice, but I just ate it plain, so this was a very healthy meal on top of being delicious. After eating a few bites I decided to try something else with it - see my post below for a Tofu Burrito. Oh wow. This looks AMAZING. 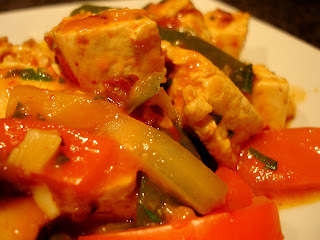 I have a similar recipe with crumbled tofu, but this looks so much better!